Increasing disposable income, changing consumer taste preferences, rising demand for processed food as well as availability of numerous product variants has buoyed the growth of biscuits market in India. Additionally, introduction of healthy, sugar-free, digestive, multigrain & oat biscuits are further contributing to the growth of this market. India biscuits market is largely driven by demand originating from urban population; however, with improving purchasing power of rural consumers, market players are making efforts to reach the untapped rural market by taking certain key initiatives such as offering low priced products (starting from $0.17) and smaller packs coupled with improving distribution network. Among various distribution channels, grocery stores led the market due to its high presence in both rural and urban areas. However, with growing number of organized retail formats in the country, hypermarkets and supermarkets are likely to exhibit highest growth rate over the coming years. Also, with rising preference for online shopping, e-retailing of biscuits is emerging as a critical media platform for expanding the product portfolio. 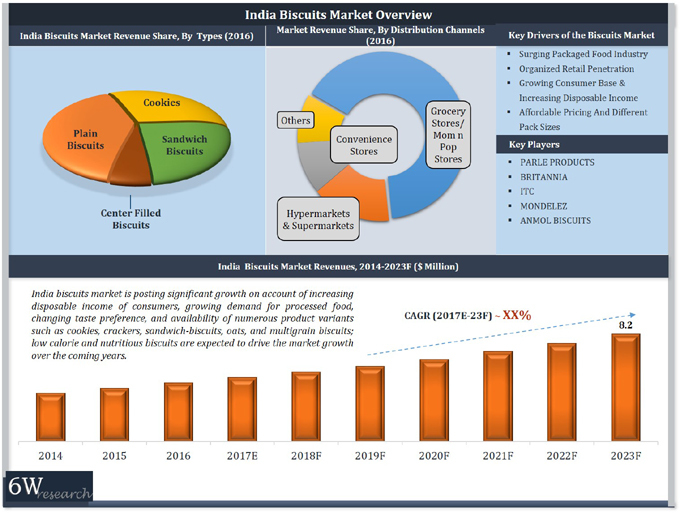 The India biscuits market report thoroughly covers biscuits market by category, types, distribution channels and regions. The India biscuits market outlook report provides an unbiased and detailed analysis of the India biscuits market trends, opportunities/ high growth areas, market drivers which would help the stakeholders to decide and align their market strategies according to the current and future market dynamics. 14.1	Parle Products Pvt. Ltd.
14.7	Unibic Foods India Pvt. Ltd.
14.8	United Biscuits Pvt. Ltd.
14.9	Cremica Food Industries Ltd.